New 10,15 & 20 site plans and raised caps for high-traffic sites! 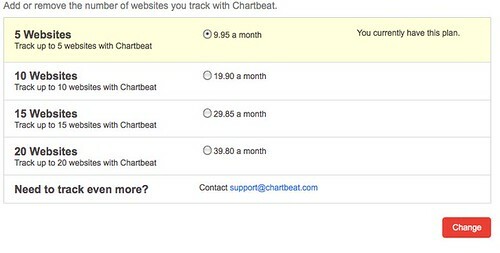 Until now, chartbeat has limited how many sites you can track to five. However, you’ve been asking for the ability to track even more sites and now you can! If you try to add a sixth site to your chartbeat account, you’ll automatically be taken to an upgrade page where you can add more sites to your account in batches of five. Alternatively you can simply go to http://chartbeat.com/plans and pick the number of sites you want to track there. As a guide, the pricing for each set of five sites rises in increments of $9.95. After selecting the plan you want, click change and hey presto you’ll be able to add more sites. One caveat: early users who signed up with Paypal will have to switch to a more standard payment method to add more domains, because of restrictions in the way Paypal handles charges. Please contact support@chartbeat.com if you have any issues. 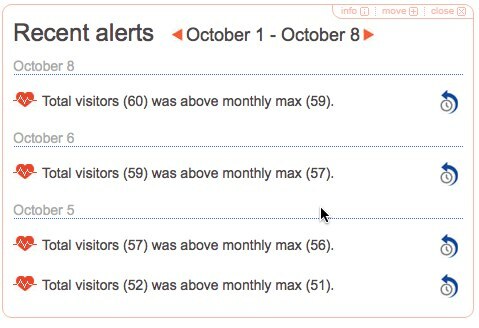 We’ve also previously been limiting the number of concurrent visitors measured on each site to 5,000 at any one time. This safely covers all but the biggest sites on the web. However, a few companies with massive audiences have been asking us for a higher limit, so over the last few weeks we’ve been testing higher limits and the system has been responding just fine. As a result, if you are hitting the 5,000 simultaneous visitor cap please do email us at support@chartbeat.com and we can move you onto a tailored plan for your size. Chartbeat analytics now shows you an alert log of all the unusual events that triggered an alert, be it a traffic alert, uptime or slow page load time. You can navigate back by week to understand how the events are grouped over time and what’s more we’ve beefed up the replay function. Always a rather hidden function of chartbeat, each alert now comes with a replay button that enables you to replay the period in time surrounding the alert and better understand what caused it. Was a traffic spike caused by a specific referrer or search term? Which page were visitors hitting when your page load slowed? What was the activity on your site immediately prior to it crashing. The replay can give you insight into all of these so that you can better understand, respond and prepare for a repeat of an unusual event. Please let us know what you think! We’ve also been making various other smaller changes to improve the performance of chartbeat, removing some experimental code and minimizing the size of the cookie we set. Rest assured we’ll keep striving to make chartbeat leaner. If you feel that chartbeat is slowing your site down, remember Firefox may be tricking you, and please vote up the Firefox bug at https://bugzilla.mozilla.org/show_bug.cgi?id=383811.